I'm building up a nice stockpile of these because of various contests, so I thought I'd post them here so they don't end up forever lost in my computer. One post for each, if I can fit them. Feel free to comment if you'd like; this isn't a gallery so much as an organization tool, and I'd love feedback if you're willing to give it. When an opposing champion plays a card, there's a 33% chance to summon a Kismet's Omen. "Fortune favors all in equal measure. But perhaps not at the same time." The post was edited 2 times, last by Legan ( Nov 9th 2017, 4:06pm ). She crept along the edge of the cliff, stiffening and holding her breath as a small piece of the rock beneath her crumbled underfoot and fell hundreds, thousands of feet to the ground far below. After a few seconds wherein the rest of the ground held firm, she slowly, cautiously moved towards the sturdier, wider section of cliff just ahead. A sigh of relief was released as her feet touched down upon the firmer ground, even as she savored the brief adrenaline rush. A moment's rest later, and she resumed her forward movement over the even narrower path that came next. This sort of dangerous journey wasn't unusual for the Highlands Blackbelt- far from it, half her time was spent on such expeditions. Her martial arts styles, created from scratch, took inspiration from the most dangerous creatures in Entrath. Extremely direct inspiration- in order to fully understand what she was making and how each style should work, the Blackbelt insisted on seeking out, observing, and (on occasion) even fighting the monsters she sought to imitate. It had worked quite well thus far- 20 trips had seen 20 styles created, each one meant for different situations, and each preparing her just that much more for anything Entrath could throw at her. Right now, this saw the young woman inching her way forward across the top of Scarcliff, hoping to reach the nest of the manticore that supposedly lived here. Frankly, the journey itself was looking to be more perilous than anything she had heard about the creature itself, deadly poison or not. At last, a wide, flat plateau loomed before her. Quietly pulling herself up on to the platform, the young woman spied the prone, snoring body of a lion at the center of a nest, and inwardly began to celebrate. ...until then she saw the goat head. The Blackbelt's hopes plummeted. This wasn't a manticore at all. It was a chimera, an infamously similar monster that also happened to have a lion's body and batlike wings, but had a snake (an entire snake) instead of a scorpion's tail. More bizarrely, it also had the head of a goat, emerging from the middle of its back- which supposedly also happened to breathe fire, somehow. A large rock made itself known to the side of the goat's head a few seconds later, causing it to cry out in pain at such treatment. THAT should have gotten its attention. Indeed, the goat head's loud, bleating cry at being struck immediately roused the lion and snake, the former of which snarled irritably at having its sleep so rudely interrupted. The tail waved back and forth through the air, undulating as it scanned the area for signs of its attacker. Spying the Blackbelt standing in a ready stance just nearby, the Scarcliff Chimera gave a massive roar before readying its tail and preparing to pounce. The woman simply grinned in response. This was the kind of moment she lived for. Use Blood Sphinx's ability on Adrenaline Rush to copy it when played. Turn 1: Play a ruby shard. Turn 2: Draw Crimson Clarity. Play a ruby shard. Play Crimson Clarity to give you an extra resource and ruby threshold. Play Scarcliff Chimera. It has Rage 1. Turn 3: Draw another Crimson Clarity. Play Crackling Vortex. Play two Crimson Clarity (you are at 5/3). Play Highlands Blackbelt. Play the copied Adrenaline Rush on Blackbelt (Blackbelt appears and adrenaline flows, strong enough for her to defeat Chimera; she is an 8/1 swiftstriker and gets the jump on it). Attack with Chimera for 4. Turn 4: Draw a ruby shard. Play a ruby shard (you now have five charges). Use Lionel Flynn's power on Blackbelt to make her an 11/1 (strength increased, Sting of the Manticore created). Pay 2 to use Blackbelt's Sting of the Manticore style. Attack for 22 damage (27 damage if we pretend chimera is still around), ending any normal game. The Highlands Blackbelt stared at the enormous songbird in front of her, trying to figure out if there was something she was missing. ...Perhaps she had expected a little too much of Cerulea's “Phoenix Guard”. Never having seen them in person until now, she hadn't realized that... well... this was not exactly what leapt to mind when one thought “phoenix”. While he had been speaking, the young woman had climbed on to the back of the closest songbird and begun to adjust herself in the saddle. The “Phoenix” took off of its own volition, before its rider could even grab the reigns. She clung desperately to what she could grab of the saddle as the Phoenix ascended to a height of roughly 150 feet, and immediately began circling the city. Eventually, the Blackbelt managed to regain enough of her bearings to pull herself fully in to the saddle and grab the bird's reigns, panting with relief. Regardless, as she began to calm, the fact that she was literally flying finally began to set in, and the young woman found herself in awe as the bird swept around the city, giving her a full aerial view of Cerulea. Somehow, even the views she'd had from the cliffs of the Highlands could not quite compare to such a scene while in motion. Impressive as it was though, she needed to look at her mount up close while she had the chance. She wouldn't be able to create anything fancy after only seeing its basic flying patterns, but it would be enough for a start. Unfortunately, there was a slight problem in that she couldn't steer and watch her mount at the same time- not very easily, at least. Perhaps this wasn't going to work after all... but, she was determined to try anyways. After about a minute of this less-than-effective observation, a voice called out from the young woman's right. The Blackbelt looked off the direction the voice had come from and spotted a woman on her own phoenix, flying beside her with a trained ease. “Do you know how?” the Phoenix Guard Trainer called over the wind. The Blackbelt shook her head. could do so later on. Yes, this definitely could still work. As they approached the ground, the trainer began to call out instructions on how she should move to land the phoenix. It wasn't exactly easy, but the Blackbelt did manage to pull it off, albeit in a way that resulted in her bird giving her a very irritated looking glare as soon as she dismounted. The Blackbelt shook her head and smiled. The Blackbelt turned to see the guard who'd initially led her in to the training compound running towards her, his face red with a mix of exertion and anger. The Blackbelt gave the trainer a quick, slightly embarrassed smile before turning and running for the gates. Use Blood Sphinx's passive ability to double the effect of Crimson Clarity. Turn 1: Play a sapphire shard. Turn 2: Draw Time Ripple. Play a ruby shard. Play the doubled Crimson Clarity to get to 6/2 and three ruby threshold. Play Supporting Fire. Play Highlands Blackbelt. Play Time Ripple to put Highlands Blackbelt back in your hand (such is the length of the journey that it certainly feels as much- or at least, I'm assuming the Highlands are a fair distance away from Cerulea). Turn 4: Start at 6/3 due to Supporting Fire. Draw Air Superiority. Activate Urgnock's charge power to make Highlands Blackbelt a 3/1. Activate Wings of the Phoenix on Highlands Blackbelt (I mean, you COULD use Sting of the Manticore, but that wouldn't make much sense in the context). Play Air Superiority (Phoenix style has been created, strength is gained due to incorporation of “flight” tactics). Attack with both her and Phoenix Guard Trainer for 7 damage and an 1 additional damage to the opponent's (nonexistent) troops. The Highlands Blackbelt steeled herself as she stood at the forest's edge, reflecting on why she was here to begin with, if only to keep her mind occupied. By any account, this would be an extremely dangerous venture. To approach a dragon, even the ones that were not particularly foul tempered, was a huge risk for anyone, of any size or skill. Especially those without any magic. Her father, normally a major advocate of her journeys, had even tried to talk her out of this particular one. Surely she could just infer the manner of its movements, fully flesh out the style without direct observation of the creature it was based on, just this once. But she couldn't. Oh, not that it was physically or mentally impossible. But it would never feel complete without this. If she wanted the style to imitate all that a dragon had to offer, she had to have reference of a dragon to imitate. It was as simple as that. She had done everything she could to be cautious about this. Of the dragons whose locations were actually known, all but two had been almost immediately thrown out. This had quickly narrowed down her options to Jadiim, the wild dragon of Feralroot, or Zakiir, the former wild dragon of Feralroot. From what she'd been able to gather, Zakiir had at some point changed from a wild dragon to a ruby one, and subsequently been chased, along with his followers, in to Ashwood. She'd been leaning towards trying to find him, being the more destructive, but slightly less territorial of the two- up until it had been pointed out that “slightly less” really didn't mean much when it came to dragons, and actually getting to Zakiir would be much more dangerous, as the Ashwood elves were notoriously aggressive. So, Jadiim it was. Hence her current position, standing at the boundaries of Feralroot forest. She couldn't dawdle forever. It was time to find what she had come here for. Taking a deep breath, the Blackbelt took her first step in to Feralroot. The young woman spun on her heel, immediately falling in to the flexible, evasive opening stance of the shin'hare style. Her eyes scanned the surrounding area... and saw nothing. Where...? Her gaze moved south to the top of a small mushroom, where a small blue fae with a long bushy tail and a patchy green suit sat smoking a pipe, a wide smile on his face. No wonder she had missed him, he couldn't have been taller than her knee- even including his large top hat. “Tis' been quite a while since I've seen someone try to venture in to Feralwood alone.” the fae stated, still smoking. The Blackbelt didn't respond, but began to back away, wary despite this fae's small size. The fae stood, dusted himself off, and disappeared in to the foliage. The Blackbelt remained where she stood, slightly confused. Had... had that been all he had to say? 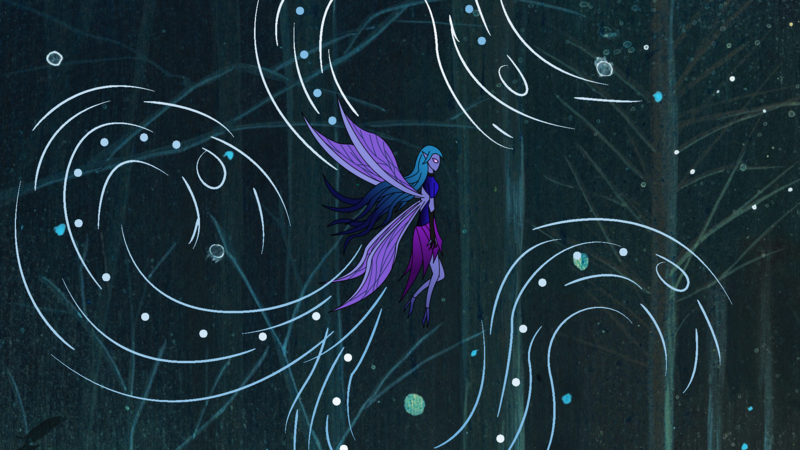 Fickle creatures, the fae. It only made them more dangerous. But her nerves were gone now, at least. Thus, without further ceremony, the Highlands Blackbelt entered the forest of Feralroot. For the past half hour, the young woman had been heading through the forest in a straight line. Strangely enough, she had not encountered any other sentient life as of yet. Though that was partially due to the sheer breadth of the forest, and likely to some extent the extremely isolationist nature of the elves that made up the majority of the “sentient” category, it was still quite strange that she had not come across even a single Satyr or Dryad as of yet. Perhaps it had something to do with her unwanted tagalong. The notion that the fae had left peacefully had quickly been dispelled upon her entering the forest. He'd popped back in a minute later, dressed in a slightly different suit, and then proceeded to follow her relentlessly while asking her an endless string of riddles. The answer to this latest one was the letter m, obviously. The riddles had started out extremely obscure and challenging, but had gradually dropped in difficulty to roughly this level as she continually refused to answer any of them. She was quite certain that any response beyond flat silence would do nothing but encourage him. She couldn't outrun him for some reason, as he always seemed to reappear at her back. Reasoning didn't seem to work either- when she'd asked why he was following her, he'd replied that perhaps she, was in fact, following him, and had he mentioned yet that it was in fact quite rude of her to be doing so? Asking the fae which way it was to the nearest landmark resulted in either him pointing in several different directions while holding a massive grin, or holding the answer hostage with (what else?) a riddle. Talking with him was evidently pointless. Thus the Blackbelt was seemingly stuck with him until he got bored of her stonewalling his questions and left. A noise from off to her right had the young woman standing in a ready stance again, this time the opening of the manti style, before the originator of the sound gallumphed through the trees and revealed itself to be a succulent cluckodon- generally known for their quality taste, not threat level. It was the type with an avian head and a dinosaur's body anyways, which were generally less dangerous than the reverse. Sensing an opportunity to rest her legs and still make forward motion for a while, the Blackbelt crept to the side before the four legged creature could see her, and began to stalk up on it from behind. She might have screamed, half in panic and half in frustration, would it not have alerted her prospective mount. The fae had somehow gotten on her shoulder without her noticing, and on top of that he was still asking her riddles, when she was trying to be quiet and stealthy. There was a loud SNAP next to her ear, and then she was looking ahead not at a chicken headed dinosaur, but a rhinoceros of roughly equivalent size. How did-?! The Blackbelt shuddered as the fae smiled widely at her from her shoulder, laughing before jumping down. The fae's voice actually sounded a little shocked as the young woman broke from stealth and charged the rhino from behind, jumping on to its back and sending it in to a panic. The beast blindly began charging forward, knocking aside any trees in its path, with the Blackbelt still hanging on to its back- albeit with some difficulty. The Blackbelt grimaced as the small blue creature spoke from behind her, somehow having gotten on board her mount before it had taken off. What exactly did it take to shake him...? Her statement was met with silence,which the Blackbelt found odd given the fae's propensity for talking. Long seconds ticked past until finally, there was a response. The tone was odd, almost serious. It was bizarre, coming from a voice she'd already come to associate with constant, near manic glee. The young woman's sentence cut out mid way as the rhino beneath her was suddenly replaced by a breeze of wild magic, sending her sprawling in to the grass in a tangle of limbs, her head facing the partially canopy-covered sky above. The fae quickly made his way in to her limited side vision before she could recover enough of her bearings to get up. The Blackbelt squinted and sat up, confused. Why would he even care? The response was short, blunt, and swift. The young woman was taken aback at the change in tone this conversation had taken, but replied all the same. The fae was silent for a moment. The small blue man's frown abruptly flipped in to a grin, one that spread further across his face than any the Blackbelt had seen as of yet, stopping just one step short of malevolent. There was an anticlimactic pause that lasted roughly two seconds before a massive wind swept over the portion of forest they were standing in, blowing the Blackbelt to the ground once again. Through the waving canopy of branches, the shadow of an enormous emerald wing flew over, followed by another shockwave that would have blown the young woman back to the ground, had she not already been splayed out upon it. And then it was gone. Over, as if it had never been. The Blackbelt was too stunned to respond. The fae grinned. Another SNAP, and suddenly she was outside the forest. Seconds ticked past as the Blackbelt remained on the ground, trying to process what had just happened. Eventually, slowly, she stood, and briefly shivered. Perhaps she COULD just create the dragon style without observation. Just make it up wholesale. Have Gardener's Hat equipped (Chlorophyllia costs 1 to play). Turn 1: Play a wild shard. Play both Chlorophyllia (you now have 1/3 and 3 charges). Turn 2: Draw Succulent Cluckodon. Play a ruby shard. Play Highlands Blackbelt. Play Jovial Pippit. Turn 3: Use Jovial Pippit's ability on Succulent Cluckodon to turn it in to a Rhinoceros. 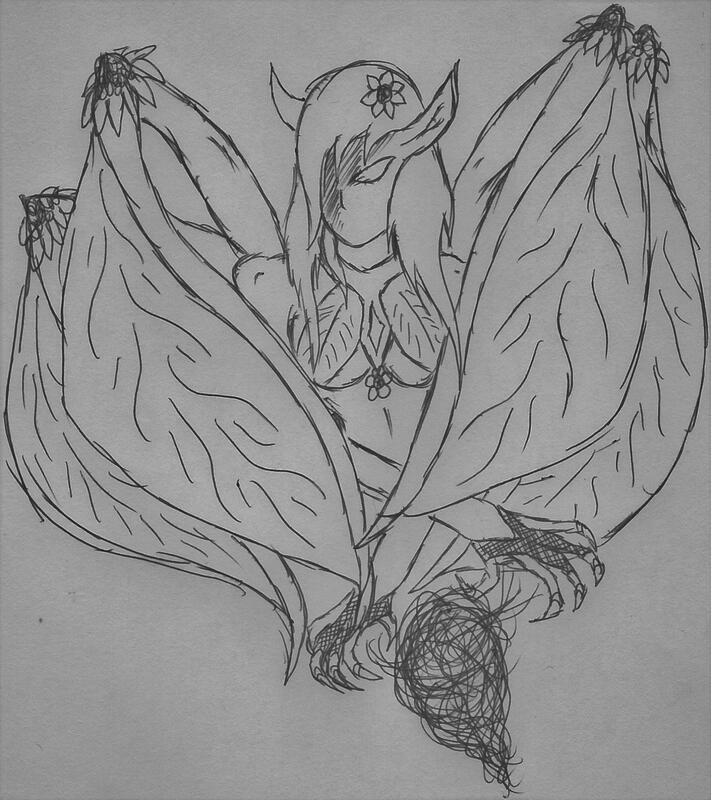 Draw Chlorophyllia but do NOT play it. Play the Rhinoceros. Do not attack. (but feel free to imagine Blackbelt wrangling the rhino). Turn 4: Use Jovial Pippit's ability on Chlorophyllia (the “rhino-turned-wild-magic”) to turn it in to Jadiim. Draw a wild shard. Play a wild shard. Play Jadiim. There are no resources left to play the Highlands Blackbelt in your hand (she is no longer in Feralroot). Do not attack. Welcome back, child. Have you come prepared to listen, this time? I shall not blame you if you choose to leave again. I certainly would do the same, were I given the option. Shall we start at the beginning? It seems as if there would be little point... perhaps, given the end of our last meeting, I should tell you of how others who have gained this knowledge reacted to it. Some simply refuse to accept their existence, either unable or unwilling to believe the truth. In their ignorance, they are blessed, for they may proceed through life unburdened, other than a persistent belief that the upper echelons of the Cerulea government are collectively quite mad. It is for this reason that I believed you wiser when you turned away before, and refused to hear my words- only fools choose to learn this of their own volition. mechanism than anything else- that which you believe can visualize is infinitely less frightening than that which you can not, after all. ...I see that look in your eye. You agree with them, do you? That we should plan to face them when they arrive? Hah, much as I wish that was possible, it is not. Fight them? You cannot fight them. None of us can. To fight them would require the mortal mind to be able to process them. Their mere existence is anathema to our senses. They do not see you as an enemy; they do not even consider you to be relevant. Keep that well in mind. the purest religion to exist on Entrath as it stands. The primals are not gods, but They... They are perhaps the closest thing to that idea which mortals could ever, will ever know. You think I exaggerate? You think they cannot be considered such; that they have no influence here? Tell me, child, do you recall the former high warlock of Cerulea? You wouldn't even have been out of cadet training yet I imagine, certainly not an apprentice yet, but you may have glimpsed him on occasion. Do you remember the bags beneath his eyes, the pallor of his skin in the months before his death? Astoria was a personal friend of mine, so I am very well aware that every night for over half a year, he was tormented by dreams, nightmares that THEY sent. They drained him, sapped the life from his bones and the sanity from his mind. Each and every night They waged war on his very soul, until, finally, inevitably, it gave out. We traced what afflicted him to its source through our magic, but our efforts at stopping Them were futile. We poured over what little is known, agonized over spells and cures as we tried to expunge their presence from his mind- but once they have grasped on to something, they do not let go. In the end, Astoria died a broken man, begging for a death we had little choice but to grant him. ...But that is not the worst of it. When he finally may have found peace in the afterlife, his body was taken, stolen away not by the Necrotic, but by THEM. His corpse, twisted beyond all recognition in to that... thing the catalogers have taken to calling the “Eldritch Dreamer”. Which I find to be rather funny- the name is meant to be singular, as if Astoria was an isolated case. But he is NOT. You think he is the only one they have taken to use as a temporary proxy? You think he is the only puppet they have ever created?! Countless have been lost to the throes of madness, and we can do nothing more for them but lock them away, while we fruitlessly search for some solution! We are not speculating here child, They have LONG been spreading their influence throughout Entrath, and it grows, it grows EVERY DAY, DO NOT SPEAK TO ME AS IF YOU KNOW BETTER! …I am sorry. I know you were unaware. But this is not this is not something you can avoid once you have learned of it. You cannot rationalize it away as some concocted falsehood, as seeing things not there. They are real, and their presence, if not their bodies, are here. Let me tell you of another. Almost a century ago, there was a man named Wilcox. He was lured, guided beyond his knowledge in to the perfect position to steal a certain artifact. Do you know the artifact I speak of? If you do not, I shall refrain from saying its name, for knowledge of it is best left forgotten, so as to reduce the chance it ever is taken again. Wilcox successfully thieved away the artifact, spirited it out from under the noses of those who thought to keep it safe. But he did not understand why he had stolen it, not truly. They were behind his every action, pushing their influence in to him through the artifact, and had Wilcox not been discovered and stopped, the item he possessed would have torn the gap asunder; let them loose in to this reality completely. For that is their main goal... and much as I hate to say it, it is going to happen, someday. I say this not because I have given up, child. Do not think I am simply a senile old man, resigned to a fate of oblivion. I say this because stopping them is simply not possible. They can be held back, yes, but there is no way to kill them; no way to destroy them permanently and prevent the coming end. No defense is perfect, no method is foolproof, and we barely have one as it stands. It is not being passive, it is being realistic. When will it happen? I know not, nor does anyone else. But happen it will. They are timeless, while Entrath is not. They cannot be held back forever, and one day they WILL breach the walls that hold them back. Always, they are lingering at the fringe, clamoring at the borders, pushing in on reality like a slowly tightening noose. What do they want? Again, we cannot know, other than their ravenous desire to rupture and swarm through the boundaries of our universe. But if you are asking my opinion, it is not us, nor our destruction they seek- or at least, not that alone. This planet is not the destination- it is only the beginning; the nexus through which they seek to pass. Entrath? What would they care of merely Entrath, when the universe is so much more...? Hmm? The Void Society? Well, aren't you well informed. I know not how you learned of their dealings in this regard, but you are correct. The society has dedicated itself to pushing Them back, forbidding them entry to this world. When one of Them breaks through, the society rebuffs it, forces it back and seals the gap before others may follow- we likely have them to thank for the fact that the state of affairs is not far worse than it is now. But They... They are an unstoppable force, and the Society not an immovable object. It costs them, each time they do this, and as the only ones who can do so their forces will one day fall from sheer attrition. They know, just as well as we do, that they are fighting a losing battle. ...that look in your eyes is still there. I can see you're not convinced... Child. If you take away one thing from this, it is that They are not an enemy you can fight. They are the unfathomable void, the darkness beyond reality. You could no sooner fight a concept than fight the eldritch horrors that reside just beyond our view. You will waste what precious time you have on a vain, futile dream. They are aliens, gods, monsters beyond all mortal conception. What must I say to make you turn from the course I know you are about to take? ...Is there truly nothing? Nothing at all? ...very well. I believe our talk is over, then. You had best go report to your master. I'm sure she will congratulate you on being willing to listen to this- after all, she intends to fight them as well. I pray, child, that you never know the arrival of the Chaostouched. For They are inevitability itself. The post was edited 1 time, last by Legan ( Feb 23rd 2017, 9:40am ). Harmonize 3: Troops in Harmony with this have this troop's other keywords. At the start of your turn, you may choose a rarity. 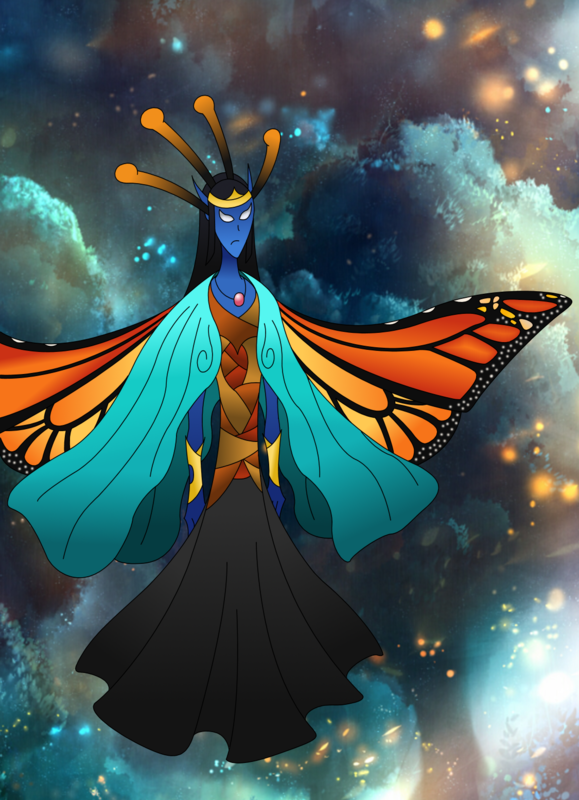 Symphona, Monarch of Tiny Hollow becomes that rarity. 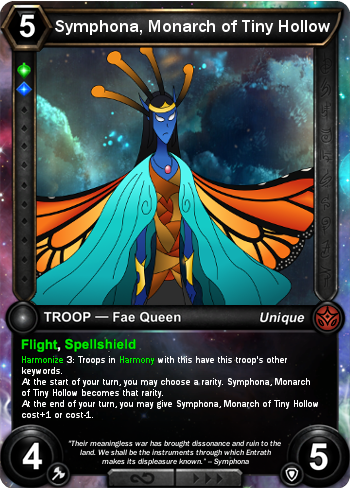 At the end of your turn, you may give Symphona, Monarch of Tiny Hollow cost+1 or cost-1. Harmonize _: Apply the following effect to all troops you control that share _ or more of this troop's qualities (ie. A trait, a threshold, rarity, attack, defense, and cost). A troop can be taken out of Harmony with another by removing one from the field, or by removing/changing enough qualities of either troop to make them fall out of Harmony with the other (attack and defense buffs/debuffs, cost alteration, etc). The same method works to bring troops in to Harmony with each other. Allegiance does not qualify as a quality, because the only cards that have Harmonize are unaligned/neutral (in a similar manner to how Valor and Dreadlings are Ardent/Underworld exclusive). Is is the prerequisite which allows Harmony to occur at all, so to speak. Symphona is part of a theoretical set (see rarity/set symbol) taking place a good ways in to the Herofall war. To summarize, Herofall has already made it evident that the neutral creatures of Entrath have it little better than those actually fighting. Some are being used as war machines (Siegesaurus), others have died just from being caught up in the conflict (Casualty of War), and whole locations that many used to call their home have been destroyed (Horrors of War). But the Ardent and the Underworld don't care. For what seems like an eternity, they simply continue their fighting, inflicting loss upon loss and casualty upon casualty on each other, heedless of anything and everything else. ...and thus they are ill-prepared to respond when an entirely new “faction” appears out of nowhere, striking both sides with equal ferocity. It is only after they have already lost a great deal to this unknown foe that the two sides gather themselves enough to understand what is going on. That is, that the majority of the sapient unaligned creatures of Entrath (the fae, the manti, the elementals, the woolvir, etc.) have united and collectively decided to take action. The Ardent and the Underworld's endless fighting has scarred the land irrevocably, and the threat they present to not only the neutral races, but the planet itself, can no longer be ignored. The post was edited 3 times, last by Legan ( Nov 9th 2017, 4:08pm ). After all that i feel bad just saying just "nice work"... but well, nice work. Keep on keeping on. Deploy - You may set another target troop you control's attack or defense equal to this troop's. "We shall teach them the folly of imperiling this world." A continuation of my Symphona design/set, which I thought would be fun to do. 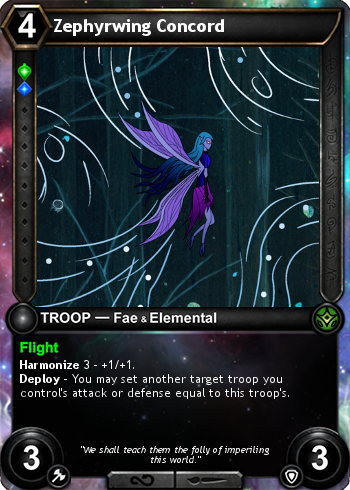 This particular fae has teamed up with an elemental- I thought it would be cool to bring back the "groups", which we currently only have four of at the time of this writing, especially considering how Harmonize works. To note, Harmonize has been tweaked in wording since the last time, and now reads as follows. Harmonize _: If you control a troop that shares _ or more of this troop's qualities (ie. A trait, a threshold, rarity, attack, defense, and cost), apply the following effect to both troops. Note that a troop can Harmonize with any number of other troops if they meet the requirements, but the effect only activates once per troop (ex. If this was out with two Dandelion Sprites, which share a wild threshold, the fae trait, and the uncommon rarity with this, it would be in harmony with both, but would only become a 4/4, not a 5/5). The effect can be removed by making the troops stop sharing enough requisite qualities with each other (ie. attack/defense is changed), or just plain removing one of them from the board. Utremeld also did some lovely fanart of this card!